Mark your diary - Sunday, 24th June and start thinking about getting a playing group together. Online registration will open in early May. You will be able to nominate a group of up to four players in one registration process. You can now register online as a volunteer - click on this link - Register as Volunteer. It is a very simple process and will only take a few minutes of your time. You need to be registered before undertaking volunteer work. 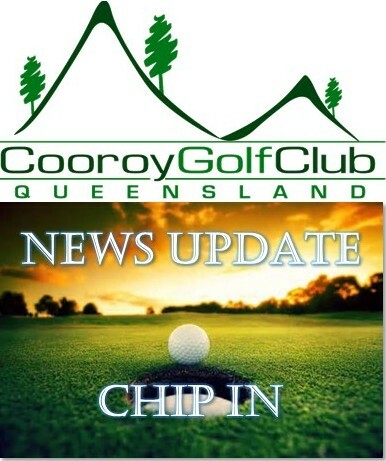 As Volunteering is a partnership between you and Cooroy Golf Club it is important that you read the Volunteer Charter which explains the arrangement in detail. Volunteer Central is the focal point for member engagement with our volunteer program and includes volunteer news, volunteer support information and details of activities in which volunteers can get involved. And, if you want to look back over past communications there is a library of NEWS UPDATE emails. You access Volunteer Central via the Volunteer tab on the main menu of our website or click this button. On Saturday, 14th April we hold our inaugural Men vs Women vs Vets 2 Person Ambrose competition. Unfortunately competition cancellations and weather have disrupted nominations so there are plenty of slots available on the timesheet. Ring the club and have your name added if you can’t make it to the clubhouse to nominate. The event will recognise and celebrate The Clubs' amazing volunteers and the work they do. Come along, enjoy the golf, get to know other club members and, learn more about our Volunteer Program. We recently introduced Todd McNamee, new Course Superintendent. Paul Dawson continues as a member of the Greens Staff along with Alex Delbridge and Brendan O’Brien. 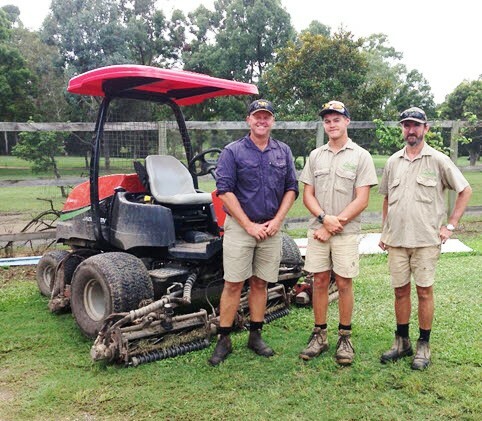 The photo above shows left to right – Todd, Alex and Brendan in front of our current fairway mower, which will soon be traded for a bigger more powerful model. Paul Dawson took some overdue leave the first week of April, with Brendan to do the same soon. Alex is a second year apprentice who has three good mentors helping him, while Paul and Brendan will benefit from Todd’s experience and management style. Course Superintendent, Todd McNamee and Greens Director, Dave Lyons meet monthly with Men's Captain Cyril Trist, Women's Captain Terri Cairns and Vets Captain Grant Smallacombe to help align course activities to best suit important match events. With course presentation in mind, Todd has suggested a couple of volunteers take down the flagpole near the clubhouse to give it a much needed clean and coat of paint before the next special day (pennants, host day). Feedback from members on course issues and suggestions for course improvements are welcome but please direct them to our Greens Director, Dave Lyons, Green's Sub-Committee members or the respective Golf Captains rather than to greens staff to avoid distracting them from their work. Greens renovation completed with 8mm solid tynes and fertilisers applied. Top dressing not attempted because of weather and now considered not necessary. Low light conditions and heavy rain have encouraged more algae on some problem greens, e.g. 10th and 12th. It is not coincidental that these greens have the most couch encroachment on the course. Tiffgreen (328) struggles with algae unlike couch. The greens staff will be applying an algaecide to affected greens. Also, an organic amendment will be applied to greens to improve the nutrient holding ability of the soil, thus keeping fertiliser where it will work best - not leached below the rootzone. Mowing practices have increased and watering reduced on the new Tiffdwarf greens nursery. Top dressing has been applied and weeds sprayed - it is looking good. Stolons from this nursery will be used next growing season to redo at least two greens on the back nine. To improve airflow on course and drying, as well as aesthetics, it is proposed to raise the tree canopy on course by removing as much undergrowth as possible. An ideal activity for volunteers - working bees will be arranged. Last week some overhanging branches and undergrowth that impact on tee shots were removed on the 1st and 3rd holes (as identified by the Greens Committee), along with cutting back of much undergrowth on left hand side of the 7th hole. We can now see the left side of the green from the tee. Thanks to the following volunteers – Rex Williams, Jim Henderson, Don Clelland, Greg Michael, Graham Laing, Doug Pearce, Terry Lyons, Ron Blount, Bob Reid and Dave Lyons. As you can see there is a great variety of work in which volunteers can be involved to improve the course. Browse the list of projects and jobs and then speak to the Project Sponsor or Job Coordinator or the club official responsible for that area of club operations if you want to get involved or need more information.